Please hold this little guy up in prayer this morning as he undergoes surgery to remove the Halo. Such a delicate procedure! Please pray for quick healing of the wounds where the pins have been bolted to his skull and for Ian’s neck muscles to be strengthen as they begin to support his neck again. 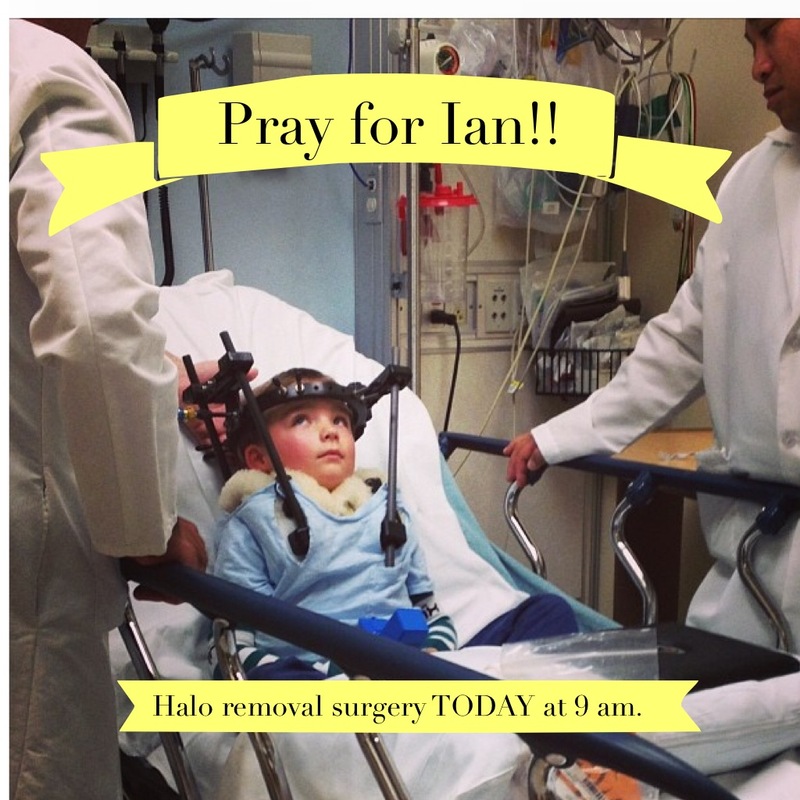 Pray that the Lord would send His angels to surround Ian as he readjusts to moving, sleeping, playing, and being a typical 4-year-old kid without the protection the Halo has offered. If all goes well, Ian will be going home today with just a neck brace! Praise God! As I said, I’ve got great praises to share! • Our sweet friend, Heidi, had a smooth delivery with her new little girl, Elanor Joy “Ellie”. She came on January 13th weighing 6 lbs. 50z. and was 19 inches long. After a brief bout with jaundice and some feeding issues, Ellie was released with a good bill of health! Heidi is so grateful to the Lord that Ellie is, so far, not experiencing many of the health challenges that arise for children with Down Syndrome. Another big praise for Heidi is that the situation with her foster son appears to be moving in the direction of being able to adopt him. What a blessing that would be! Heidi’s next court hearing is on Good Friday. Please pray that God would allow the judge to rule in favor of starting the adoption process if this would be best for her little guy. Let’s also continue to pray for Heidi and her family as they adjust to life with a newborn and as they learn more about parenting a special needs child. God has certainly called this family to a special mission with His children and we can be confident that He always equips those He calls! • Ian – Another big praise report this week comes regarding Ian, our Halo kid! If you have missed Ian’s story, you can catch up HERE, HERE, and HERE. Ian had an appointment for (hopefully!) a final check this morning at 9am and I’m still waiting to hear the results of that. It has been 6 long months for the Davis family, but life in the Halo should be coming to a close this week or next! Wow! Please pray that the results from testing today and the consensus of the 3 doctors who are teaming to make a final decision will show that Ian’s bones have fused well in his spine and that the Halo is ready to come off! Exciting as this is, I know Ian’s parents, Lesily and Jason, are also quite nervous about what the next few months will hold. Please pray that for a hedge of protection around Ian physically as he readjusts to life without the Halo and as his neck muscles strengthen to regain the ability to fully support the weight of his head. Pray for a hedge of protection around Lesily and Jason emotionally and spiritually, that the temptation to fear and worry would be met with faith and constant reminders of God’s goodness to them through this whole storm. 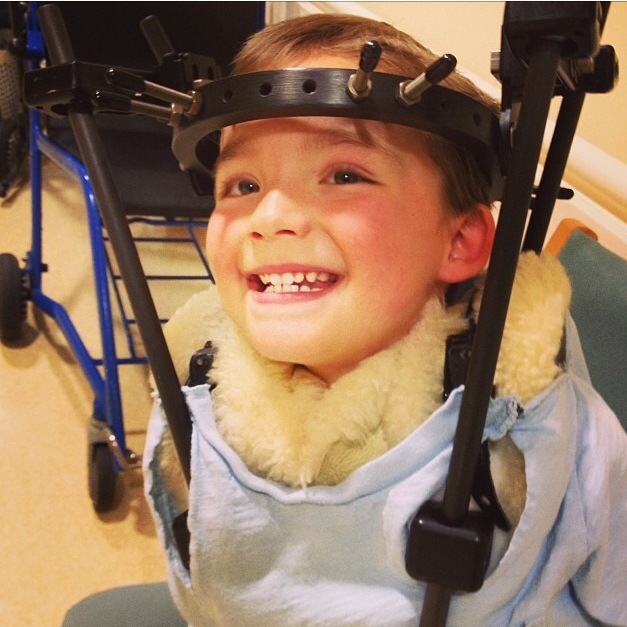 Speaking of God’s Goodness through the Storm, Ian’s mom, Lesily, has begun a blog documenting their incredible journey after Ian’s neck injury. If you’d like to read more about what God has been teaching Lesily (and you will be SO blessed if you do! ), you can find her blog, Goodness in the Storm, HERE. • Finally, I have to thank you all for the prayers and encouragement as my own family has been through the roller coaster of selling our home and searching for a new one. I’m happy to report we have found a wonderful rental to call home until the market is a little better for buying. This new home really seems to be perfect for us! It is way more home than we were expecting to find – it will give us an extra room for the kids PLUS an extra room for Throne of Grace – in a fabulous location!! 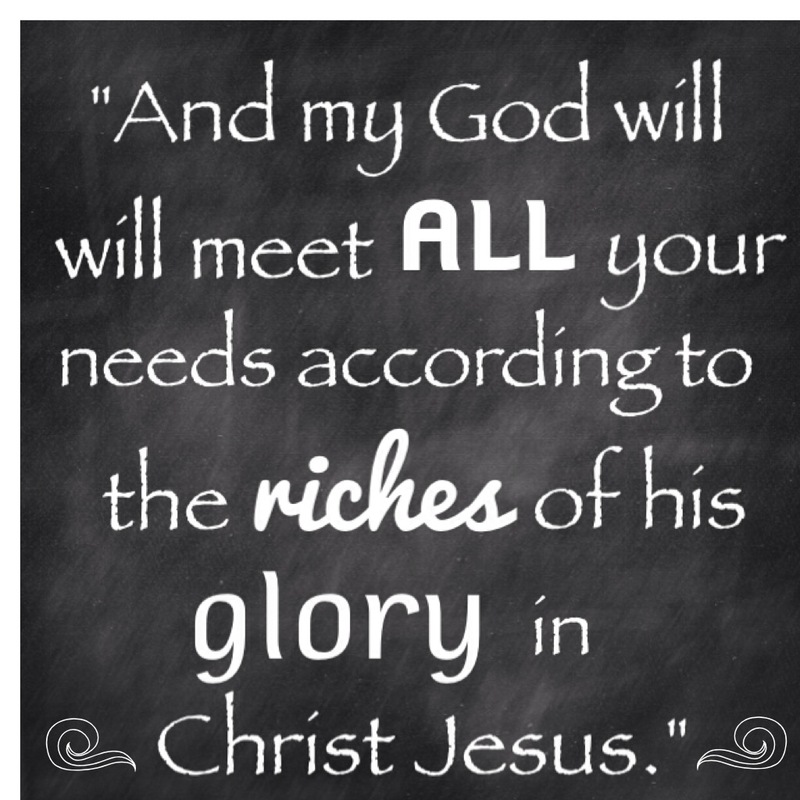 That is a big answer to prayer and a great reminder of how God gives abundantly more than we ever ask for or dream of! Please praise the Lord with us! We’d also love prayer as we kick the packing into high gear (in order to get this rental, we had to shift our move date up by THREE weeks! Yikes!) Please pray as we transition to our new home and neighborhood that we would honor the Lord and come through the chaos triumphantly. As we all know, Satan likes to prey on our stresses and bring division and worry! It would be our joy to add you to our prayer & praise posts! Hello! Yes, it is Tuesday again and I’m just now getting this out! One of these days I’ll get back on track but I’m not promising it will be anytime soon! What needs are you faced with today? Are you tempted, like me, to doubt that the LORD wants to bless you, or even that He is able?? Say, “No!” to that temptation with me today and instead put on the character trait of TRUST, so perfectly modeled by our Savior. Isn’t that all we need? • Big, big praises regarding Bridget and a big thank you to all who lifted her up to Jesus this past week! The MRI and various other scans showed absolutely no abnormalities, masses, or anything major to be concerned about! Praise the Lord! A subsequent meeting with her previous surgeon, however, still did not turn up any answers as to why the sudden vision loss. They will continue with patching to strengthen the weak eye and would love continued prayers that they will get some clear answers soon. • Please continue praying for Deb and her family as they begin the journey home from China and get settled into daily life with their new little one, Quinn. Let’s ask the Lord to strengthen their bonds as a family and give Quinn all the comfort and security he needs to feel at home. We can also begin praying for his health and preparation for surgery in the coming months to correct his cleft lip and palate. • Still no news on my move so I’d love continued prayer for our family. 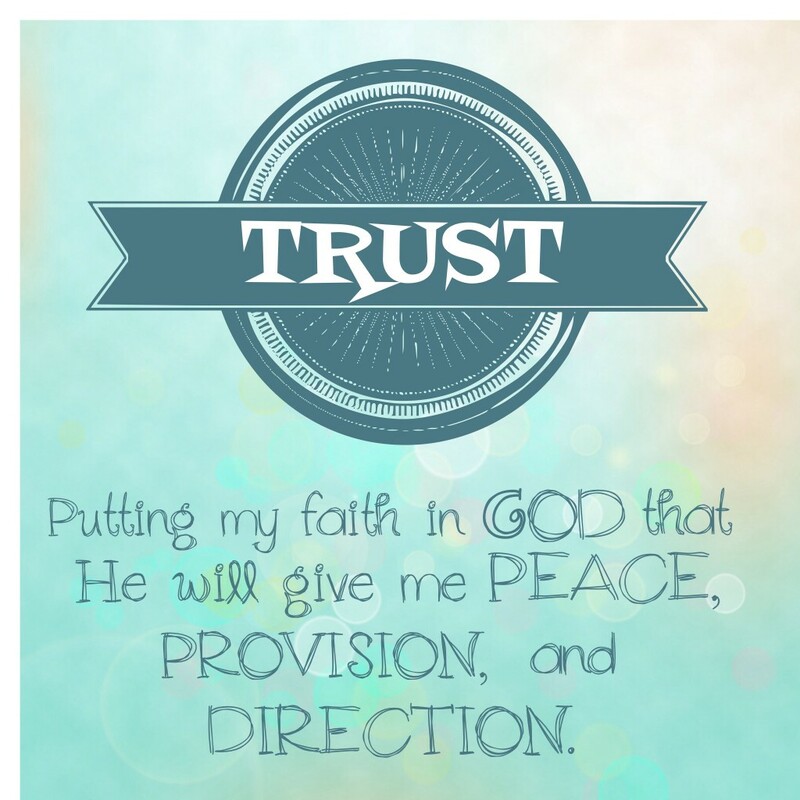 If you could pray that we would trust the Lord for his PEACE, PROVISION, and DIRECTION as we approach the close of escrow, we would appreciate it!